Everyone remember about my sale tomorrow? This Saturday from 10:00 am to 1:00 pm I'll be at the Garth Veal Ice Arena in Magrath at the Kids Show. I'll be there with a large stock of Make-up Boards and Jewelry Organizers. Since I first posted about my make-up board they've started to pop up all over the internet. I thought as one final way to keep these boards and this sale at the front of your mind I'd do a round up of just some of the make-up boards I've seen floating around (I especially appreciated those that took the time to link back to me, to show a little blog etiquette). Beautylish shares a really pretty tutorial, I like the subtle fabric choice. Alexa Gianna made hers a strip of fabric covered metal instead of a large frame. Would work well for a specific space and not too much make up. Janessa shared her cute board on her blog. I like how she hung it with ribbon and the thick wood is really cute too. The Momnivore added cute labels to each section, love it. Mandy from Sugar Bee Crafts simplified the process by using a metal bulletin board she found at Ikea. I don't know why I haven't thought of adding my bobby pins to the board, I can't ever keep track of those things. Feisonista added little personalized words of inspiration, just what you need first thing in the morning. Bipolar Spirit also used a magnet board, I like the shelf underneath, would be very handy. I love Ginger Goddess's. The paper she used is just gorgeous and she found a really interesting frame, I think hers really pops. Audra at the Kurtz Corner embellished her cup. Liz Marie had enough make up to require two boards side by side, and check out how she stores her brushes. AnJayla got creative and used an old cookie sheet. She was also really clever, all of her make-up is the same brand and they all have black lids so she put the magnets on the lid instead so she could see the colour on the bottom. I love Jami's fabric choice and the distressing on her frame is the perfect compliment. And lastly is Priscilla, who rather than hang it on the wall uses an easel to display her board. These aren't the only boards out there but just a few I could find. Hopefully you've been inspired and reminded just how useful these are so that on Saturday you'll come on down and buy one from me. If you live far away then I'm sorry but chances are I'll have some stock to offer up on the blog. Thanks for putting up with my advertising, I swear this will be the end of it. Hi! Thanks for including my makeup board in your round up! It was such a cool idea and I use it everyday! Can you fix something for me though? My name is Audra not Andrea :) I'd appreciate it! Thanks for featuring me in your makeup board round up! And thanks for having the great idea in the first place! thanks for featuring my board - - I am LOVING it!! Thank you for posting my board.. you really sparked a great idea! Thanks for including me in your round-up. I didn't mention you as inspiration, b/c I didn't know your project existed! I'm all about blog etiquette, but seriously, never have seen your blog or project! I did just look it up on pinterest and sure enough, it was there! Thanks for featuring me as well! I absolutely adore the idea. It's kept my make up so much more organized and it looks awesome to boot. Love it! how did the girl make the labels? i like that a lot and i was just curious what she used?? I have a problem with my makeup sliding off. I have used the magnet tape so maybe its not strong enough. I put on a one inch strip across as much of the back as possible and the makeup still slides off. I don't want to break any eyeshadows. What magnets are you guys using? LOVE this!!!! 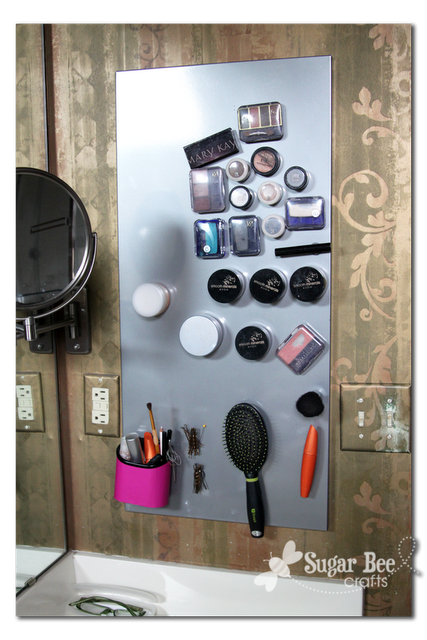 God, I need a magnetic makeup board bad. Your board was a great inspiration! My friend pinned it yesterday and I made one today. Great idea! And nice examples of others boards. 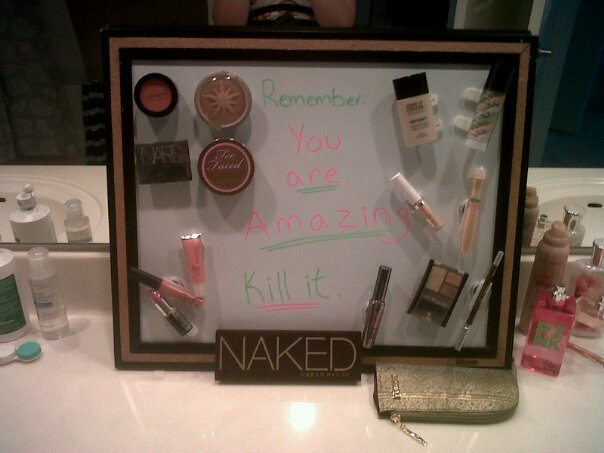 Thanks for the wonderful easy solution for my messy vanity. Hey! Just to let you know that your makeup board is still the most beautiful one I have seen. You inspired me to make two, one for me and one for my daughter. Now, I can dig through all my baskets and boxes of makeup and actually use it!! This will make me actually use my makeup..I'm more of a naturalist but do like to Glam it up! September 12 - Catie turns Two!